A sun storm, or coronal mass ejection observed by NASA's STEREO spacecraft on Dec. 12, 2008. Call it the ultimate solar fake-out: A new study has foundthat when storms rage on the sun, they don't always shoot out in a straightline, but actually switch directions. "This really surprised us," wrote researcher PeterGallagher of Trinity College in Dublin, Ireland. 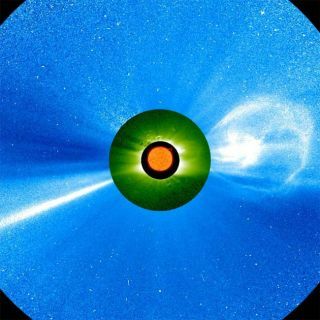 "Solar coronalmass ejections (CMEs) can start out going one way ? and then turn in adifferent direction." The result was so surprising that researchers initially thoughtthey'd made a mistake. But after triple-checking their calculations on dozensof solar eruptions, the team arrived at the same conclusion. "Our 3-D visualizations clearly show that solarstorms can be deflected from high solar latitudes and end up hittingplanets they might otherwise have missed," said study leader Jason Byrne,a graduate student at the Trinity Center for High Performance Computing. Waywardsolar storms that try to head out of the plane of the solar system seem to beguided by the sun's global magnetic field, which is shaped like a bar magnet, backin line with the sun's equator, researchers said. Stereo-Aand Stereo?B are two spacecraft that provide a view of solarflares fromdifferent points of view. Stereo-A is watching the sun from a point in Earth'sorbit ahead of our planet, while Stereo B is trailing behind. Thisallowed the team to create fully stereoscopic models of the storm's particleclouds and track them as they billowed away from the sun. The researchers usedan innovative computing technique called multiscale image processing, which ?sortsthrough objects in an image according to their size. Inmedical research, multiscale processing has been used to identify individualnuclei in crowded pictures of cells. In astronomy, it comes in handy forpicking galaxies out of a busy star field. Gallagher and colleagues are thefirst to refine and use it in the realm of solar physics. Theresearch is detailed in the Sept. 21 issue of the journal NatureCommunications. "The ability to reconstruct the path of a solar stormthrough space could be of great benefit to forecasters of space weather atEarth," said Alex Young, Stereo senior scientist at NASA's Goddard Space FlightCenter. "Knowing when a CME will arrive is crucial for predicting theonset of geomagnetic storms."